A travel agent with an "absolute heart of gold" died from a wound to the throat when she was fatally attacked at her workplace. 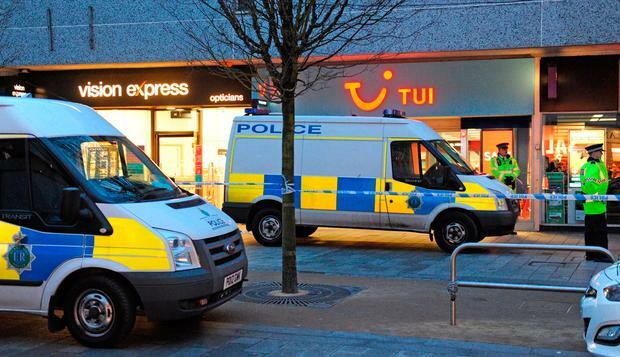 Cassie Hayes, 28, was stretchered out of the Tui branch in Southport, Merseyside, where she was assistant manager, shortly after 1.25pm on Saturday and later died in hospital from her injuries. Police said a post-mortem examination showed the cause of death was shock and haemorrhaging as a result of the wound. A 30-year-old man from the St Helens area is being held in custody on suspicion of murder in an incident which is believed to be domestic-related. Colleagues and friends of Ms Hayes, from Southport, were among those who brought floral tributes to the scene in Chapel Street which remains cordoned off. Ex-colleague Gordon Campbell, 44, from Preston, said he would always remember the sound of laughter when they worked together. He said: "We used to do a late shift and it was often just me and Cassie, and she would have me in tears. The things she would come out I probably couldn't repeat them to be honest but she was just so mischievous all the time. "But happy, full of love and she had an absolute heart of gold. She will be most definitely missed by everybody that knew her. "She had quite a lot that had gone on but she never took a smile off her face ... she was a little slip of a girl and to think what happened to her is tragic." Her ex-partner was among many paying tribute online to Ms Hayes who was originally from the market town of Alnwick, Northumberland, where her mother and sister live. Leah Mcdonald, from Southport, wrote on Facebook: "What can i say. This girl was and has been my absolute world from the first moment we met on the 4th july 2007 till this very day. "We had are fall outs, our ups and downs but i can tell you now despite all that we absolutely loved each other and out of all the people in the world i could not of picked a better mammy for our child. "She's just a gem, my best mate, Even when we split she was there for me ... this girl has been my rock and the most amazing mammy. "i am heart broken and numb. How anyone could do this to my cassie." A fundraising appeal on website GoFundMe has already raised more than £4,000 - set up by Travel Gossip, an online community of travel professionals. The appeal message read: "Many of us never met Cassie but we *know* that if we did, we would have thought she was great. We know, because we are travel. "We understand that Cassie had a daughter, and so on behalf of everyone in travel I would like to propose that we come together and contribute to fund to help Cassie's family as they see fit. "Our thoughts go out to everyone affected by this terrible incident, including all the TUI staff. #agentsunited". Earlier, a Tui spokeswoman said: "We send our deepest sympathies to the friends and family of the staff member involved. "We're doing everything possible to assist the local police with their investigation and support our customers and staff at this difficult time."